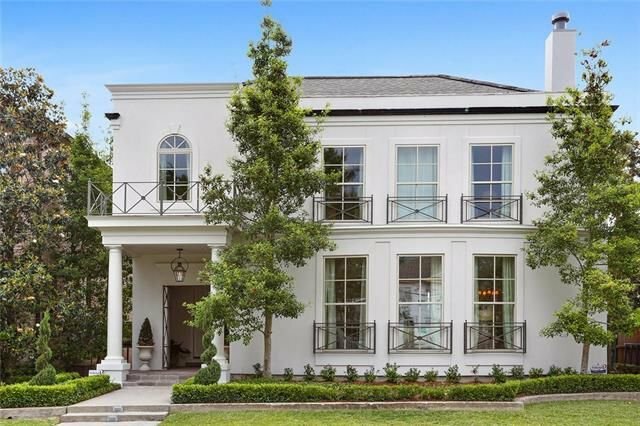 What a stately listing this house is. There are two massive columns leading up to the front door and the shrubs and trees are professionally manicured. The living room is stately as well, with all-beige walls and woodwork – which your furniture will easily fit into – its own fireplace and a wet bar adjacent to it. There’s a wall of windows overlooking the professionally landscaped yard which let in plenty of light. “It also has a dining room, a media room, a sunroom, a kitchen with a banquette, two fireplaces and a staircase to the attic for potential expansion,” said Burke. The dining room is set off with large columns and has an easy-to-clean slate floor. This room has large windows and is bright and sunny. 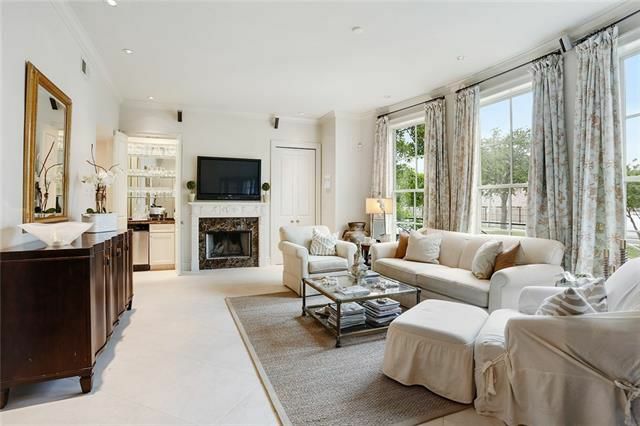 The family room also has large windows, plenty of light and enough room for entertaining and Saints parties. “There’s also a two-bedroom, two-and-a-half bath, living room with a fireplace and wet bar and a kitchen with a dining area dependence included in the house,” said Burke. The kitchen has a restaurant stove, all stainless steel appliances and an eat-in breakfast area at one end. With its easy access to the waters of Lake Pontchartrain, Lakeview has a large sailing and boating community and is served by two yacht clubs, the New Orleans Yacht Club and Southern Yacht Club. The neighborhood is dominated by two large parks, New Basin Canal Park and City Park. The Lakeview neighborhood’s boundaries are Robert E. Lee Boulevard, Orleans Avenue, Florida Boulevard, Canal Boulevard and I-610 and Pontchartrain Boulevard. Major north-south roads are Pontchartrain Boulevard, West End Boulevard, and Canal Boulevard - the last a prolongation of Canal Street; major east-west roads include Harrison Avenue and Robert E. Lee Boulevard. Throughout most of the 19th century and early 20th century, Lakeview was mostly undeveloped swamp. The New Basin Canal was cut through the neighborhood in the early 19th century. Though the Navarre section, encompassing the area around City Park and Florida avenues, began developing slowly early in the 20th century, large-scale residential development of most of the area began after World War II, with the predominant housing style being bungalows. Originally, Lakeview was mostly middle class, but it became more economically upscale in the last couple decades of the 20th century. By the late 20th century, many larger newly constructed homes had replaced older, more modest homes in much of Lakeview. Hurricane Katrina hit southeast Louisiana at the end of August, 2005. As the waters of Lake Pontchartrain rose with the storm, a section of levee floodwall along the 17th Street Canal near its mouth with the lake collapsed catastrophically. By early 2006, a handful of homes had been restored. Some two-story homes had been reoccupied on the second floor while the first floor was gutted and renovated. Hynes Elementary School is located in Lakeview and the New Orleans Public Library serves Lakeview. The Robert E. Smith Branch Library is in a $4.6-million facility that opened in March 2012. It has 12,700 square feet of space. [update] It has 17 computers and about 40,000 volumes of books. In the post-Hurricane Katrina period, the library system operated the Lakeview Branch, housed in a 64-foot by 20-foot modular building.